Highly polished chrome, accented with striking black and red enameled lines, form this beautiful old frame. The backing is made of heavy cardboard, with a satiny textured chocolate-colored covering. The inside of the backing is a gorgeous gold background with lilac floral print. 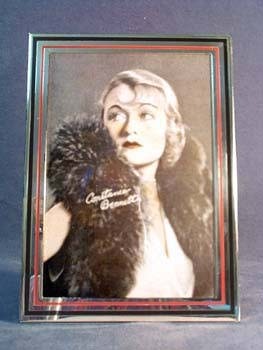 Inside this great 7-3/8" x 5-3/8" frame is a 5" x 7" half-tone print of 1920s, 30s and 40s film star Constance Bennett. The clear plastic cover has been replaced, and the attractive vintage frame is in like new condition.